Discussion in 'Music Corner' started by DMortensen, Oct 21, 2014. I've not done a comprehensive assessment of this, but there are a surprising number of pictures of old guys like RR (who is probably younger there than I am now*) at recording sessions with girls and women they are working with on their laps. At least, that's what jumps out to me about that picture. Well, RR was an old lech, actually kept a separate apartment where he took girls. He had weekly auditions, and in one of those, a lovely eighteen-year old Shirley Jones was hired before she even sang! In 1949, RR was 46-47. About the pictures, you can see from the two images of Rodgers, Martin, and Pinza with the door behind them, that many of these pictures are tightly cropped. So, there are versions of these pictures out there with more picture. But ultimately, I think they may have wanted to cover up the studio in these pictures. It was an old building, not particularly pretty (to most people). It was only after South Pacific that it became famous and valued. That's really something, thanks for the info! It was easy to imagine the outlines of the situation from the pictures. If you are able to find those uncropped versions, that would shed some light on what we want to know. The other interesting thing about those pictures: the film stock must have needed lots of light, because the ceiling lights (different version than later, with what looks like glass globes below the metal shades) look like they're off, which means the photographer brought in their own lights to create the pools of light that we see the musicians clustered within. Later, when cameras got smaller and films got faster, we see and enjoy the whole space lit up more than adequately by the ceiling lights alone, and there's so many of them that the light is very bright and even. It's almost enough to identify where the pictures are taken simply by looking at the light on faces, although that's a simplification and ID's from that method alone are quite unreliable. Still, the difference between early pictures and later pictures is notable. 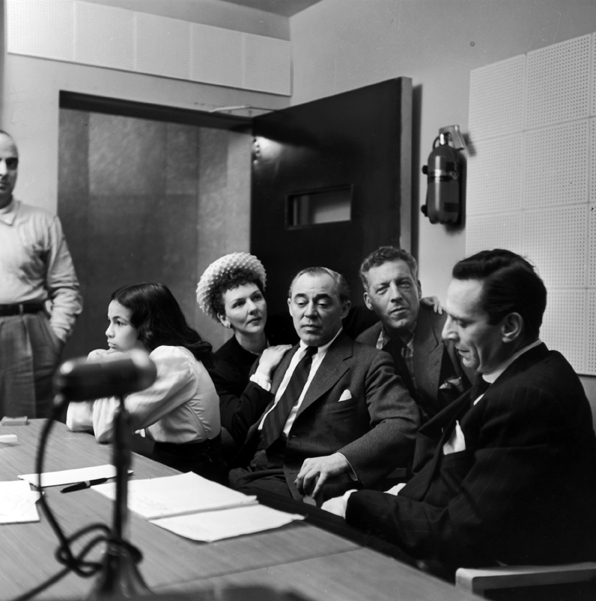 An "original cast recording" of Rodgers & Hammerstein's South Pacific with Ezio Pinza and Mary Martin was recorded in 1949. Both conventional metal masters and tape were used in the sessions in New York City. For some reason, the taped version was not used until Sony released it as part of a set of CDs devoted to Columbia's Broadway albums. Dan C and DMortensen like this. What I get from it is that this moment was at the transition from recording through phone lines to 799 7th Avenue with the recording medium there (which Frank Laico told us about), to recording locally onto a tape recorder sitting in the control room. Since they were recording onto both, one would think that both recording devices were at 799. Looking in Michael Gray's great database, South Pacific was recorded at 30th St on April 18 and 19, 1949. I've found some pictures showing the old control room without any recording devices, and that is for a Rise Stevens session, with pictures taken by W. Eugene Smith and Fred taking pictures of W. Eugene. Looking again in Michael's database, the only two Rise Stevens sessions in 30th St., ever, were February 16 and April 14, 1949. Or at least those were the only two he could find. And since the absence of proof is not the proof of absence, we can only assume that the pictures I have of the old control room without tape recorders could have been taken in February or April of 1949. Your highlighting of the fact that a few days later they were recording on both lacquer and tape seems to confirm this timing. As I'm frantically trying to get ready to get out of town, someone who I really like emailed me asking if I was going to be in Suffern again to give an advance look at my presentation about 30th St for the AES. I answered that since no one had previously expressed interest in such a thing, I had not made any arrangements to do so, but that I'm willing to go almost anywhere that can be reached by train from Penn Station to show off what we've found. 1956 - 1962 "Leave It As It Is"
~1971 - May 29, 1981 New Mixers, control room and studio remodels, last session before demolition in 1982. Within each era, we look (as appropriate) at the control rooms, studio, microphones, mixing consoles, recording media, control room monitors, and meet a few of the people who were working there. It's a full hour and a half. Not sure what you're asking. I have a pretty big TV (60") with HDMI, and good bandwidth for internet. I live in a small Brooklyn apartment. If you're willing to host as many as 5 or 6 people including yourself and me I'd be willing to find my way to Brooklyn and show this thing. And if we can get other people to come, too, that's kind of a requirement and makes it more fun for all. The place I'm staying has one chair as near and a 32" TV as I can tell, otherwise it would be fine as it's right near Penn Station. Seeing pictures big is much more enjoyable and enveloping. Anyone else interested in coming, if this works out? Hmmm, I see I didn't mention a date. Since I haven't had time to update my presentation I'm planning to work on it next week, so that puts us at Saturday or Sunday the 13th or 14th. Either of those work? Aargh, sorry, the total count would undoubtedly be somewhere around 5 or 6, not 5 or 6 plus "other people". Lots of distractions and issues to settle right now. David, did you get the PM I sent you the other day? It's in your Inbox at the top of the page. Just to be clear about this, I'm sorry to say I've made no arrangements this year to be in Suffern, since no one has said they are for sure interested and likely to show up. While I'm sure Fletcher (formerly of Mercenary Audio, not the SH forums) would be happy to have you spend time in his cool pub, you would need to entertain yourself. I'm totally open to being someplace else reachable by train or foot on either Saturday the 13th or Sunday the 14th, but have no idea where that would be. I will not have my projector with me. These first two pictures MIGHT be in the Plaut residence, although I'm not sure they had the penthouse as early as these likely were taken. 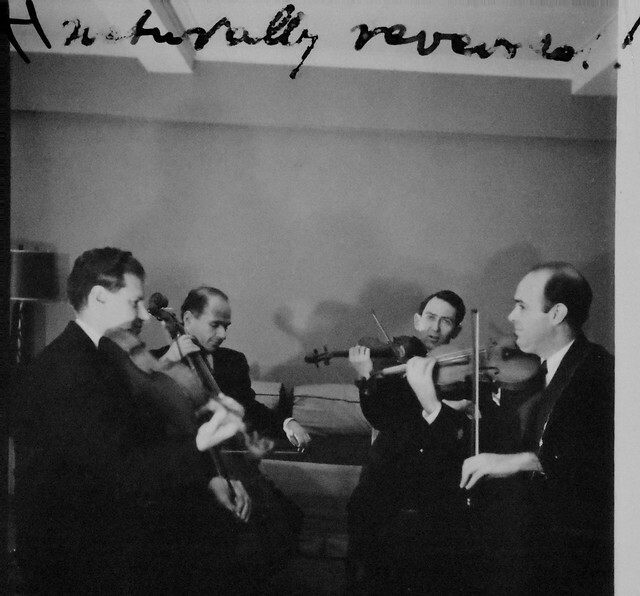 They are obviously the same string quartet in the same small room, which Fred Plaut has helpfully pointed out is "naturally reverbs" or "reveords" or something similar. They look familiar but I can't place any of them. Can you? ...these pictures are from MSS 52, The Frederick and Rose Plaut Papers in the Irving S. Gilmore Music Library of Yale University. Gathered by me in October 2015 with help from Emily Ferrigno and Richard Bourse, very capable and d helpful librarians. In what I think might be other news (don't remember posting it but may have), I stumbled upon ID's for these guys. 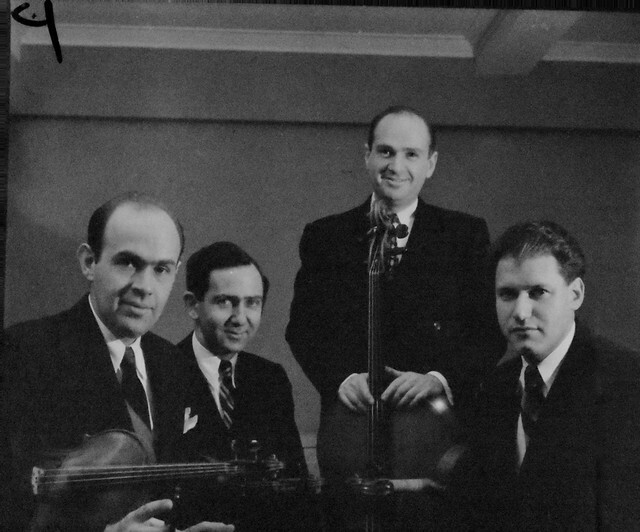 They are the Stuyvesant String Quartet, with Sylvan Shulman, violin, Bernard Robbins, violin, Alan Shulman, cello, Ralph Hersh, viola. The caption is "Naturally Reversed". Again, if this is already known, sorry. It's hard to keep track. My photo library didn't have the info. OK, I'm in my NYC apartment and I think it will be acceptable to have a very small gathering here, like up to 4 people including me. Three or four years ago I was in a different apartment and did this and three people showed up and we talked for three hours, went to dinner nearby where we talked for two more hours, and then talked for an hour while we walked to transportation and stood around. George Schowerer was one who came and while we were waiting for others I video interviewed him and that's where that video on my Youtube channel DansoundSeattle came from. He talked about his career at Dolby and working for Columbia Records. So I feel confident that if anyone can come by it will be enjoyable. This place is about a 90 second walk from Penn Station, and is up one flight of stairs. Because I'm such a neatnik (hah! But still...) I'll ask you to remove shoes and either be in socks or slippers that you bring. The TV is only a 32" or maybe 40", and we'll all be fairly close so it should be OK. I'll need to eat after a few hours, so we can go to a nearby place for Thai food or something. There's a Thai place that I like about two blocks away (I stayed here a year and a half ago). PM me if you are can come and I'll tell you the address. First three people to commit get in, if there's more than three willing. I'm sitting on kind of a wooden sofa while typing this, and although there are pillows there's not quite enough, so it may make sense to bring some kind of stadium cushions if you have them. We can use them for the duration of the meeting. Agenda, as much as it can be known: we'll chat for a while first to get acquainted, and then I'll do the 30th St Life and Death talk straight through for an hour and a half. And then we'll chat some more. I just now got back from having lunch with Thomas Z. Shepard. Actually, it was less lunch and more him first looking at Plaut pictures and helping identify some people, and then the both of us watching "Company" and me recording his commentary. He had long been planned to join me a week from Friday to do a live commentary on the movie, but he discovered a little more than a week ago that he was double booked that day (even though he picked the day). He graciously agreed to meet and let me record his thoughts to be shown with the movie. He expressed his enjoyment at looking at the pictures, and lived through the full film even though, as has been said here, he is not proud of his performance in the situation of the movie. I told him that I thought he did as well as he could with a performer who, for whatever reason, was completely incapable of giving the performance that was needed and which the performer was supremely capable of giving, and that the solution he came up with as Producer worked well to capture that supreme performance, albeit later. Now I need to make that into a presentable form. That was a pretty cool experience and I hope it works at my event. yasujiro, lukpac and GLouie like this. Did you ask him if that Moog was the one he was using? Do we know what the very last Cast Recording done there was? Was it Annie? I completely forgot about the Moog. There was a lot going on as we looked at pictures and then the movie, then he left immediately as it was late for him being someplace. The last one at Masterworks is Barnum. May 1980. Don't know at this time if there were more after that. My theory is these shots were staged and lit with the intention of being reproduced in trade publications, and also sent to newspapers as handouts for reviews, etc. You'd always assume a newspaper or trade magazine would be printed on yucky presses, so you'd want tight, easily defined compositions with significant definition between the subject and background. Much easier to reproduce. They weren't made with an artist's or journalist's eye, they were just part of the promotional machine. The lights appear to be on (most notable when they can be seen in the otherwise dark backgrounds), but were overpowered by the photographic lighting. Yes, I agree. The shots of South Pacific look staged, obviously for publicity and marketing. Mary Martin wears two different dresses, why? Different days? But some of the pictures look different, perhaps not staged. And there are some revealing details. Juanita Hall is in her stockings, with her shoes nearby. Many of the other shows with pictures of the studio do not look staged. The pictures of the actors recording a show were not as successful marketing tools as pictures of them in costume *in* the show itself. What was the question about a Moog? There's a picture or two earlier in the thread showing a Moog synthesizer set up in what could be Studio D, or it could be somewhere else. TZS apparently produced or performed a synth album, and the question was if that was THE one. I was, as usual, overwhelmed by the situation and with my #1 priority getting his commentary, so I forgot to ask or to even find the picture of the synth. In a completely new and different occurrence, I found a website devoted to finding and examining the buildings built by the original architect of the 30 St Studio building, J. Cleaveland Cady, and also found a way to contact Cady's great-grandson. So I did, describing why I'm interested in Cady, with links, and he replied nicely and sent a long description of his research into his grampa. There's apparently lots of Cady buildings at Yale, so I was going to try to look at some of them while I'm there. Oh, and he said was really into Columbia LP's for a while, and asked if I am "a records guy". I'm not really but I know a bunch of you are; I'm not sure what he would want to talk about regarding records, but should I refer any of you to him? Dan C and lukpac like this.